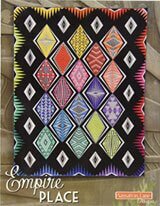 Can I enlarge a quilt block to be a whole quilt? I bought an adorable horse block. It's a paper pieced pattern that is 8" x 10". Ideally I would love to enlarge the block to be a whole quilt. However, a 2' x 2' block quilt would also work. What is the easiest way to enlarge it? I talked to Fed Ex and they said it would be extravagantly expensive to blow it up with them. The following paragraph is intended for those that may read this in the future. From what you've written, Brittany, I do not believe it applies to you at all. Please take no offense as none is intended. 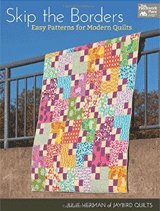 When you buy a quilt pattern, there is nothing to stop you from making changes to it to suit your needs. However, there is the idea out there that changing a design by a certain percentage makes a design/pattern one's own and therefore saleable as original work. Some may believe that changing the size of a design as I'll discuss below changes it enough to call it their own original design. While I am not an attorney and this advice cannot be construed as legal advice, I do not believe that that is the correct interpretation of copyright. Now to your question, Brittany! My Mom used to say..."What's time to a pig?" Even being from Iowa (originally) that kind of confused me. But over time it came to mean that pigs don't really care about how much time anything takes. Time has no meaning. 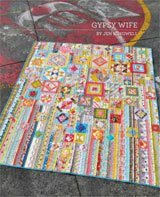 I'm betting that just like me, you'll never have enough time to make all the quilts you want. So to save time, I'd have it enlarged at the copy store. I agree. Enlarging an 8"x10" block to bed-sized would be extravagantly expensive. Even more importantly, after spending so much money you wouldn't even want to try putting that much paper into your machine. I LOVE to paper piece, but I fear you'd be fighting it the whole way. A quilt you fight to piece often becomes an unfinished quilt that languishes, forgotten, in a box in the back of the closet. A woeful waste of your time and money. An alternative is to turn all the pieces into templates. Again—'Yucksville' if you ask me. There'd be bias edges all over with long seams to boot. Not a fun project to work on at all! Now, enlarging it to a 24" x 24" quilt block...that's in the realm of probability. It'd also be way more economical. Get the original enlargement done at 240%. That'd give you a block that's 19.2" by 24"—I'm assuming the block is in portrait layout. Then you'd just run copies (larger paper of course) and tape them together to control the final cost. If the block is already broken into subsections in the original-sized pattern, you might not even need to tape copies together. The one thing you may run into at a place like FedEx/Kinko's or Staples is that they will not want to violate copyright by making an enlargement. You may need to contact the designer directly. Let her/him know what you're doing to get their written permission to provide to the copy store. Remember, quilt designers are people just like you. They want to be treated fairly. They want to be paid for their work. (You've already purchased the pattern, no problem!) They're also very interested in what quilters are doing and how their patterns are being interpreted. You never know what kind of relationship could develop out of this contact. Go for it! Once the pattern is enlarged, you may have to dink around with the lines to extend it out to a full 24" for the width. An alternative to making several of the same block is to make the enlargement so that it works on-point. For your 24" block, the length between opposite corners is 33.93" (24" x 1.414). That's pretty big. 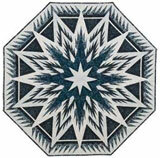 The block is now the focus of a medallion quilt layout. 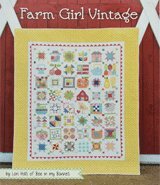 Surround it with other pieced blocks or possibly squares of horse-related fabrics depending on how much time you have. Have fun with it! Make a copy of the pattern. Set the original aside. Draw a grid of equal squares over the copy. Now you can use the enlargement function on a copy machine and blowup each individual grid section or group of sections, depending on how large the grid squares are. Use the extra lines in the pattern outside the gridlines to help you tape the pages together. Depending on the software in your computer, you may be able to do the same thing mostly at home. To get your pattern into digital form, check to see if your library has a scanner available for public use. Mine here in Plainfield does. I can scan to a thumbdrive or even email the scan to myself. Brittany, again this is for those who may read this at a later date, you cannot share/sell these scans/digital files with/to your friends. You can not give away or sell hard copies of the enlargement or original pattern. The copyright for the design and instructions resides with the original creator. Period. I hope this has helped you decide how to proceed. I'd love to see what you do. Please consider sharing your finished quilt here. Readers, please share your thoughts using the 'Comments' link below. Comments for Can I enlarge a quilt block to be a whole quilt? After one class on the paper piecing, I wanted to try a more complicated block. Quilt maker Magazine had a pattern called Cardinal View they have had several (I think nine) blocks to make a wall quilt. Some of the pieces were quite small. I made a copy of one block. I enlarged it for hundred percent. I had to print it on several sheets of paper and tape them together, but it worked fine. I did this on my home copier. I now have a nice wall hanging to hang at Christmas. I am thinking of taking a different block, Enlarging it to hundred percent, and making a square that I can put on the back of my Jean jacket. Hope this works for you too. An alternative that I use regularly is a software called Big Picture. It is very simple to use. You scan your original paper pieced pattern so you then have a jpg or a bmp. You click on File, then Open, click on your original pattern. Then on the right of the screen you tell it what new size you want it to be...example 24 x 24. Tell it to print and it prints out all the sheets with Column and Row numbers on each one. They give you 1/4 " edge that you overlap and tap together. Voila!! Tape it well and you'll have enlarged all your paper pieces to make you a larger version of your art work. Add several wide borders and you'll have a decent size lap quilt or wall hanging. From the Editor: Excellent share, Jeannie. Thank you!